Still, not until articles are location-tagged manually by the reporter using Google Earth will we get something that feels right every time. 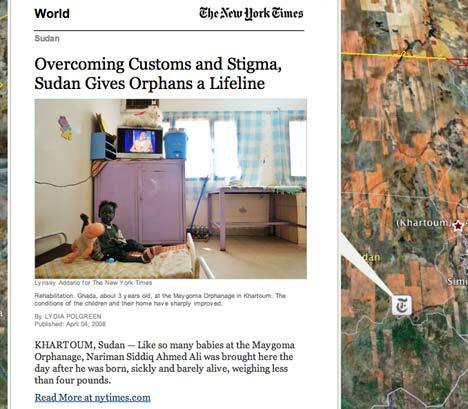 In the Sudan story above, we should be able to peer at the roof of the orphanage. In other cases, it might make sense to add migration routes, disputed borders, warzone front lines, multiple placemarks, georeferenced photos, map overlays and/or no-go zones, and have all these linked to from the artlcle — and vice versa. 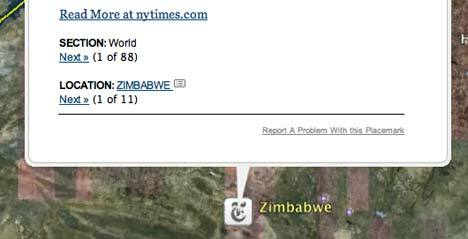 At least one MSM realizes people want to know the location of news articles. I hope they do this with links in Google Maps — I’d much rather look at things in my browser instead of opening up Google Earth and mucking around with layer stuff though. Google Earth is more likely to crash than my browser is, especially with layers that have movies, or 3D stuff with lots of vector points. Thanks for the review. Your last point, basically, that we need human intervention to make this really valuable, is right on. The answer – community. Make this interactive – let site visitors add in data or point out relevant geographic features. This needs a bit more “social media” and it’ll really be cutting edge.